The Willows Cabin, our historic one-room log cabin, is furnished with family heirlooms, offering our guests the restfulness of times gone by. In a forest clearing, sits the quaint Willow Cabin. The front lawn invites you to a relaxing time under the willow tree with your favorite book, or overlooking our secluded valley of pine and native oak. Keep a watchful eye for our woodland friends; visits from deer and turkey are daily occurrences. A private outdoor hot tub, under the countless stars, is a perfect romantic Black Hills escape for couples. Open May thru September with a minimum 2 night stay. Our cabins are smoke free and smoking is restricted to outdoors. A short walk up the hill brings you to the charming Frontier Cabin. This cabin sits atop a rocky knoll with an unforgettable view of the Black Hills from the covered front porch. The distant hills offer the perfect backdrop for the first morning rays or a romantic sunset. Bent willow furniture, on the front porch, invites couples to relax away the day. Watch the deer move through the valley, listen to the babbling spring below, hear the pines whisper. With your favorite book in hand and your camera near by, spend your day like no other. The sky fills with countless stars beckoning couples to enjoy a soak in your own private hot tub, reminiscing your perfect stay at Willow Springs. Open May through September. Minimum 2 night stay. We take your desire of rest and relaxation very seriously. Our goal is for you to enjoy the most restorative experience possible. Please consider your quaint cozy cabin as your personal retreat. 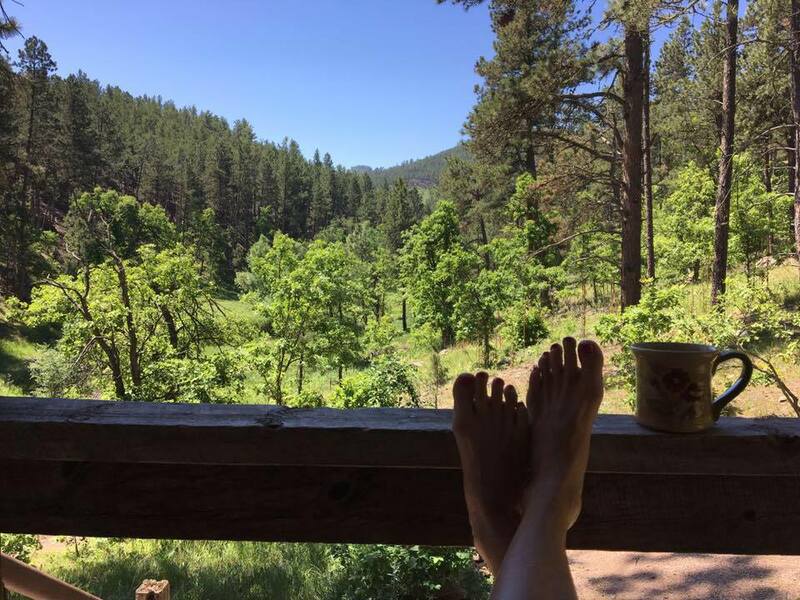 Make yourselves comfortable and relax into your Black Hills surroundings. We will be here to get you settled in and make sure your needs are met. While we honor your privacy, daily we will stop by to check the hot tubs, pick up any trash you might have and any towels you might like to have replaced. We can help you with directions, suggestions of things not to be missed and recommendations of the best eateries in the Black Hills. Let us know how we can help. If you are a past guest, we need to let you know we no longer serve breakfast. We hope you will continue to enjoy the beauty Willow Springs has to offer.